It seems that people have always desired to create artificial life, especially artificial humanoids. Is it humans' desire to have the creative power of gods? Males' jealousy of the power of women to give birth? People's greed for power over offspring who, unlike biological children, can be controlled? Whatever it is, this month's words highlight some of the different ways people have imagined creating artificial life. I've listed them in the order the words entered the English language, which in some cases was a bit surprising to me. It is not the order in which humans devised these creatures. that pulls no punches but has dramatic Caldecott-winning illustrations done with cut paper is Golem by David Wisniewski. 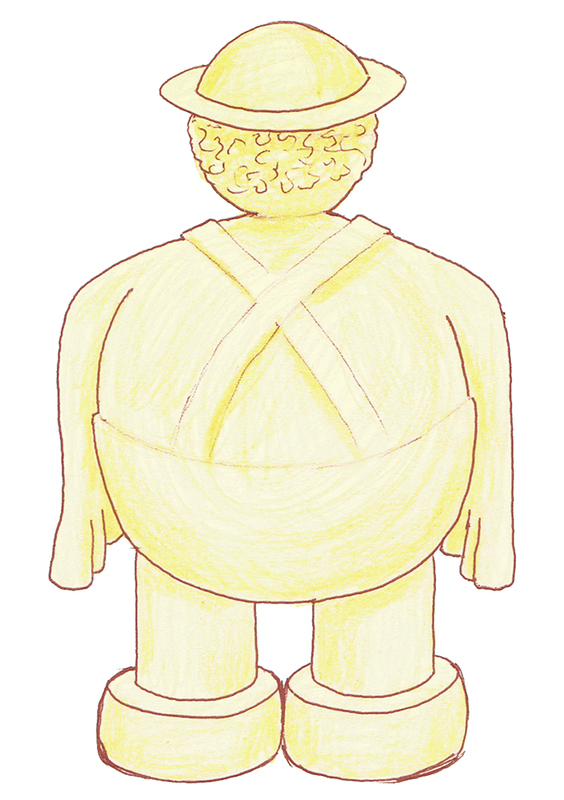 Chapter books featuring golems include The Golem's Eye by Jonathan Stroud, and Fablehaven by Brandon Mull (I did not like this book, mostly because I felt that the plot was driven purely by the unbelievable selfishness and stupidity of [at least] one of the protagonists. But both P and T absolutely love the series, so obviously what bothered me didn't bother them. And as a bonus the series also includes a limberjack with artificial life, so it's got that going for it.) 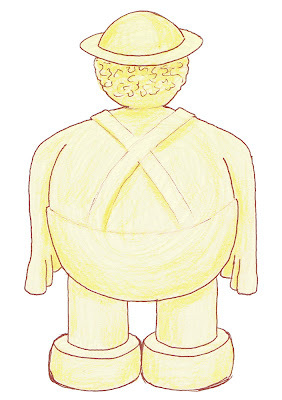 For the younger reader or listener may I suggest Kate and Sam and the Cheesemonster? For older readers I also suggest Feet of Clay by Terry Pratchett (not juvenile, but a story that really explores questions of free will, personhood, and what it means to be alive). robot (1920, coined by Karel Capek's brother Josef from Czech for "compulsory labor owed by peasants") A robot, like an android, has a scientific rather than magical explanation for its ability to mimic life. Robots range from rough chunks of metal that speak in a monotone to beings that can pass for fully human. There are far too many books featuring robots to try for a big list, but I'll mention three series that P enjoyed when he was probably around second grade: Norby, the Mixed-Up Robot by Janet and Isaac Asimov, the "Andrew Lost" series by J.C. Greenburg, and the "Akiko" series by Mark Crilley. * For reviews of several books featuring "Frankenstein monsters," plus a zombie book and a homunculus book, see my Oct. 5 post Frank'n'Stan 'n' More. 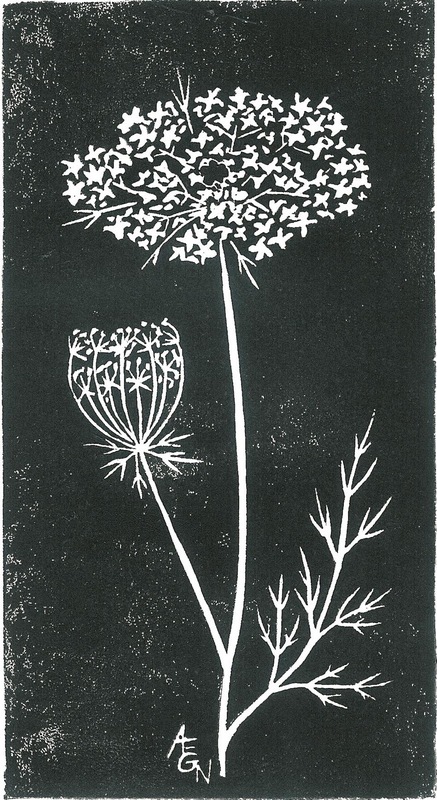 I have here today three block prints of Queen Anne's lace, from three gardening alphabets. First up is the Q from Gerard Brender à Brandis's Wood Engraver's Alphabet. It shows his all-over, meticulously detailed style. But although his depiction is very detailed, it's not laid out at all like a botanical print but instead seems more like a close-up snapshot in a field, or else a design for fabric. Queen Anne's lace, with its tiny white lines, is a natural for carving into a black background as Brender à Brandis has done here. The second Q comes from Mary Azarian's Gardener's Alphabet. Azarian paints her wood block prints in this book with watercolor, making them perhaps less dramatic, but brighter and more cheerful. Azarian's version is no botanical drawing either, since she's shown not only the plant but a whole scene of people picking and enjoying the flowers. Although this piece mostly uses the more traditional black lines on white, the thick field of plants and flowers is actually done by leaving the black background. Finally, my version of Queen Anne's lace, made as the Q for my botanical alphabet poster. Unlike the other two, I've focussed on just one plant, but like them I left the black background around all the tiny white details. I made sure to include one of my favorite parts of the flower - not just the little flowerets, but the delicate, feathery spikes of the leaves and bracts. 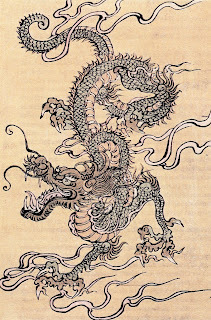 Yesterday was the first day of the Chinese Lunar New Year, and this is now the Year of the Dragon. I shall, of course, celebrate with block prints of dragons! 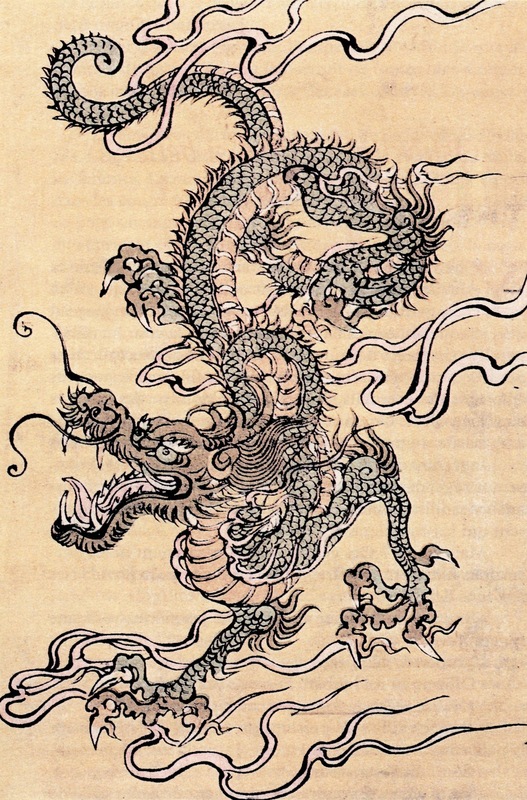 While you enjoy them, consider how the dragon is magnanimous, stately, vigorous, strong, self-assured, proud, noble, direct, dignified, eccentric, intellectual, fiery, passionate, decisive, pioneering, artistic, generous, and loyal, but also tactless, arrogant, imperious, tyrannical, demanding, intolerant, dogmatic, violent, impetuous, and brash. No wonder you need to be circumspect when dealing with dragons. And no wonder dragons never responded well to those medieval European knights charging in pell mell with their rude swords and accusations. appreciate.) So, what does the Nian look like? That's an excellent question. I sure wish I knew the answer. Maybe sort of like a Chinese lion with touches of unicorn and ox? I wasn't able to find any definitive traditional depictions. 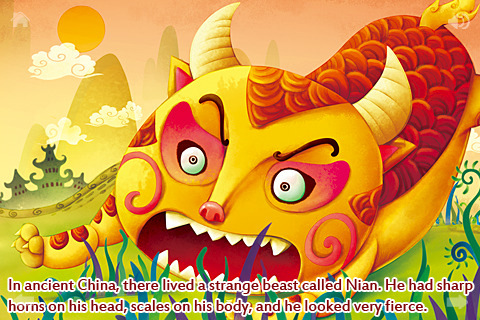 In a cool linguistic note, however, "nian" is also the Chinese word for "year." 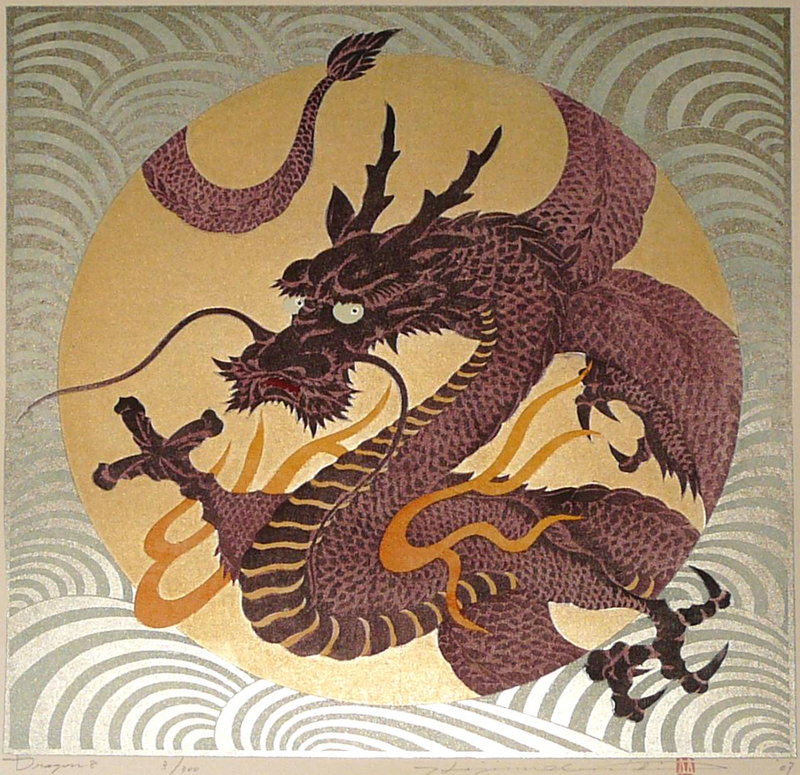 So, Xin Nian Hao - Good New Year (and good new Nian) - to all! 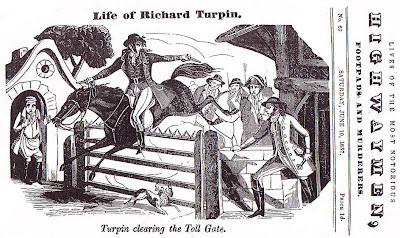 I can't remember exactly how it came up, but P and T have had a poetry unit recently in school and T said something or other to which the only appropriate response was to start reciting "The Highwayman" by Alfred Noyes. I know the first several verses by heart, but after a while I declared that I wasn't doing the poem justice, and I fetched a book and started again, reading it aloud to T and P with all the melodrama and beauty it deserves. "The Highwayman" (1906) is not the sort of poem that's fashionable these days. The story it tells is pure soap opera without any attempt at exploration of self or capturing what it is to be alive in our modern world. The language is over-the-top poetical, right down to Tim the Ostler's "hair like moldy hay," which cracks me up every time. If Noyes submitted this poem to a critic today he would be scorned and derided and held up as an example of the worst kind of amateur idiocy. He would certainly not be published, much less admired. So let me tell you what happened when I finished my dramatic reading of this less than stellar poem. T immediately ran to get paper and pencil, settled herself on the loveseat beside me, and composed a poem of her own. Her poem was about 20 lines long, describing a fairy gathering in a dark woods. It borrowed the use of repetition from Noyes, as well as a certain flavor of moonlight and mystery. Over the next week or so T reread "The Highwayman" enough times to memorize the first verse and bits and pieces from other parts of the poem. All fired up, she had me print out several pages of poems for her, her favorites selected from the stack of anthologies I put in her eager hands. In their school poetry units over the past few years, P and T have been regularly instructed not to make their poems rhyme. When they come home complaining, I explain to them that the teachers are just trying to make sure that their first priority is to pick the perfect word for the situation, instead of trying to jam in an irrelevant or inappropriate word simply because it happens to rhyme. But after trying to help justify the teachers' reasoning, I go on to sympathize with my children, because in my heart I know something about poetry that all the critics of the past fifty years or more seem to have missed. 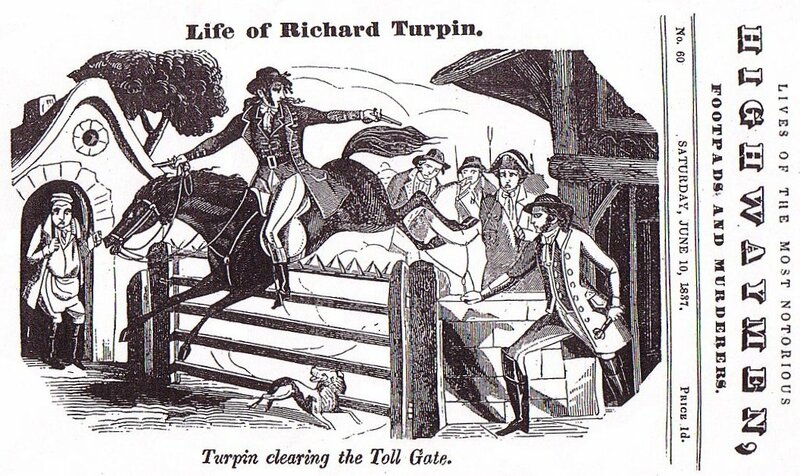 I'd be willing to bet (if I were a betting woman) that "The Highwayman," for all its melodrama, has created more poetry-lovers than all the deep, gritty, relevant, impenetrable words of today's "best" poems. Prose broken up into lines is not poetry, and perhaps it takes a child to prove that simple fact. Of course I'm absolutely not saying that words have to rhyme to be poetry. What I am saying is that children - and perhaps adults, too - don't learn to love poetry by reading just any old words. The power of real poetry is that it grips us more deeply than the mere meanings of the words. The words of poetry are more than their sum. They are meaning and sound, rhythm and emotion and color and light, exploding pictures in the mind and unfurling blossoms in the heart. Poems pour into us in a purer form than prose, and it's all those poetic tools that make it possible: simile and metaphor, startling images, juxtapositions, repetition, alliteration, rhythm, and yes, rhyme. The best poems sound like they rhyme even when they don't, because the words move with such a cadence as they pour in. And the poems that sound just like prose? Well, do they make you grab a pencil and start writing your own visions? Do they cling to your imagination so that within days you have them by heart? Do they make you hungry for more poetry? That's what "The Highwayman" did for T.
We have snow here, for the first time this winter (not counting that crazy October snow, because that wasn't winter yet.) P and T were outside as soon as they got up this morning, trying to make snow horses before they had to head off to school. This has got to be the first winter I've ever experienced in which there was no snow until mid-January, so instead of being sick of snow already, as we normally would be by now, it's a fun winter novelty. 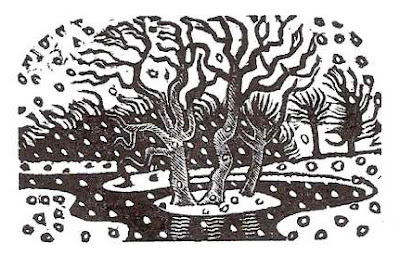 In honor of the snow, and of the fact that I refilled some bird feeders this morning after seeing T and P off on their booted and mittened way, I feature here today two pleasing little wood block prints by Eric Ravilious. and neat. The figures are wooden. The views are artificial. The subjects are either stiff or twee. Avoid them. It's the sort of thing people like to take classes in." Ouch. (Not just for Ravilious, but for those amateurs who dare to take classes in something best left to True Artistes who rate the Art World's approval!) Anyway, I'm not crazy about all of Ravilious's work that I found on-line, but I find these two particular prints delightful. 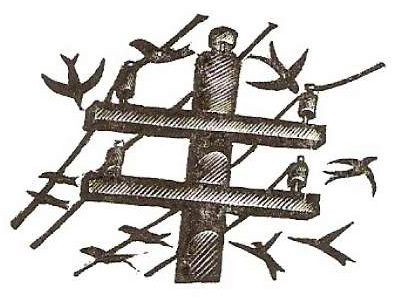 Swallows, wood block print by Eric Ravilious, 1932. Quotation from The Independent, 13 July, 2010. Happy Friday the Thirteenth! We'll have three of them this year, the most possible in a calendar year. 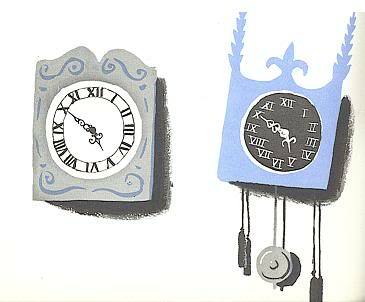 (Every calendar year must have at least one, and at most three Friday the Thirteenths.) 2012 is extra-special, though, in being a leap year with three Friday the Thirteenths, something that happens only once every 28 years. And that gives an extra fillip of fun to the phobic: our three Friday the Thirteenths are each exactly thirteen weeks apart. Thirteen has had a long history of superstition in many cultures around the world. Two of the most common "reasons" are that in Norse mythology Loki was the thirteenth god to join the party at which he caused the death of Baldur, and in Christian lore Judas was the thirteenth disciple, who caused the death of Jesus. Really thirteen is probably seen as an imperfect number because it's one more than the nice mathematical roundness of twelve. But what about when the thirteenth day of the month falls on a Friday? What's that all about? A study in 1907 asked 1,875 college students to list all the superstitions they knew of. Only two listed "If the 13th day of the month comes on a Friday, evil things are more likely to happen than at any other time." But in 1933 another study found that 95% of seniors at seven colleges believed that "Friday the 13th always brings bad luck." Something happened in between to popularize a new superstition. Finally, you'll need to know what to call the fear of Friday the Thirteenth that you'll find in books and possibly real life. 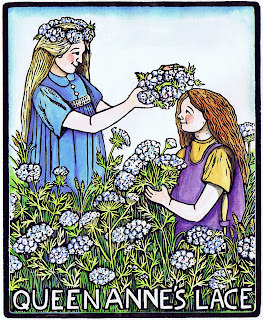 The first word is friggatriskaidekaphobia, named after Frigga, the Norse goddess after whom Friday is named. The rest of the word is the more commonly known triskaidekaphobia, fear of the number thirteen, which first appeared in a psychology text in 1910. 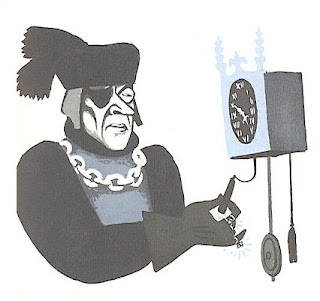 (It's built from Greek roots, although it's the Greek for "three and ten" rather than the Greek for "thirteen.") 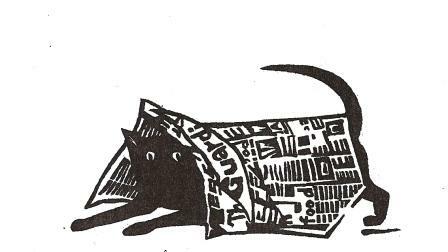 Another word for fear of Friday the Thirteenth is paraskevidekatriaphobia, from the Greek roots "Friday," "thirteen," and, of course, "fear." Most sources say this word was coined by therapist Dr. Donald Dossey, but one source said it first appeared in 1911 and was first written in a mainstream source in 1953. I don't know when Dr Dossey was born, but as he's still alive and working I have my doubts that he was coining psychotherapy jargon a hundred years ago. Somebody must be wrong on this! Anyway, instead of thinking of Friday the Thirteenth as an unlucky day, it would be a lot more fun to think of it as a magical day, and enjoy! 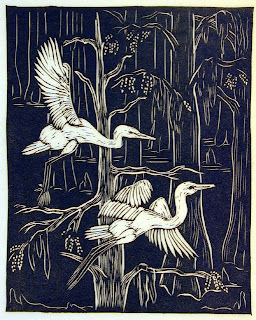 Anna Heyward Taylor (1879-1956) was an artist known for her block prints and watercolors. 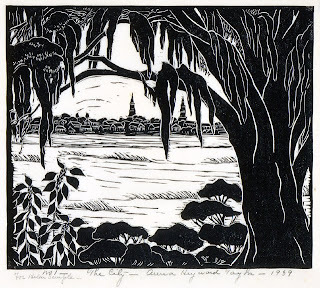 She's particularly known for her work depicting landscape and culture of South Carolina, where she was born and lived for much of her life. 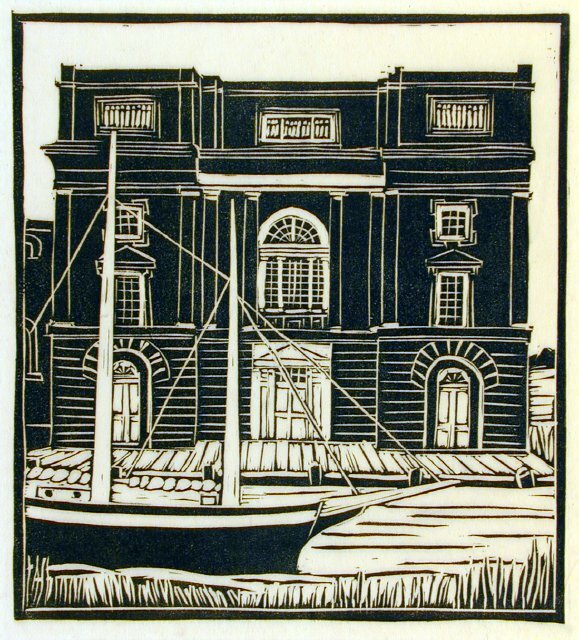 She did, however, travel extensively, where she worked with artists who specialized in Japanese style woodcuts, and artists in Provincetown, Massachusetts, who were developing their own unique style of woodcuts. (There will be posts on each of these styles some day, no doubt.) So while Taylor is known as a regional artist, her work was certainly influenced by her broad artistic education. One thing I find particularly pleasing about Taylor's work is the balance of black and white. In this image of Charleston in the distance, for example, the heavy blackness of the tree makes a nice frame, and the blackness of the tiny buildings contrasts perfectly with the whiteness of the intervening space. 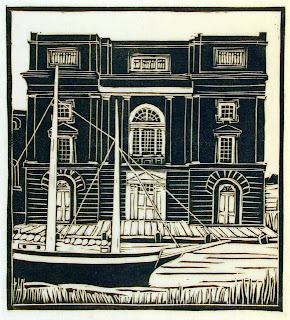 In this one, Bennett's Rice Mill, I really enjoy the "carviness" of the lines. There's no lack of detail, but the piece looks distinctly carved. You can see the direction and depth of the blade. I really like that hand-crafted quality. Taylor did a lot of pictures relating to the agriculture of South Carolina, from boll weevils to people working in the cotton fields. Bennet's Rice Mill is from one series of South Carolina subjects. (I'd like to include one with field workers, but I don't have enough space, so be sure to check out some of the other images at the Gibbes Museum of Art.) Anna Heyward Taylor also did pictures of South Carolina animals, a subject I can really relate to, since I keep coming back to my local animals as subjects. I think Anna Heyward Taylor deserves a little more recognition. 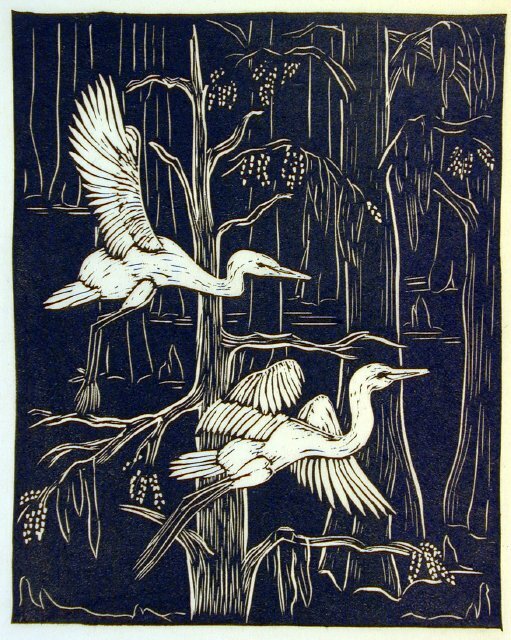 White Egrets from the series "This Our Land," linoleum block print by Taylor, 1948. 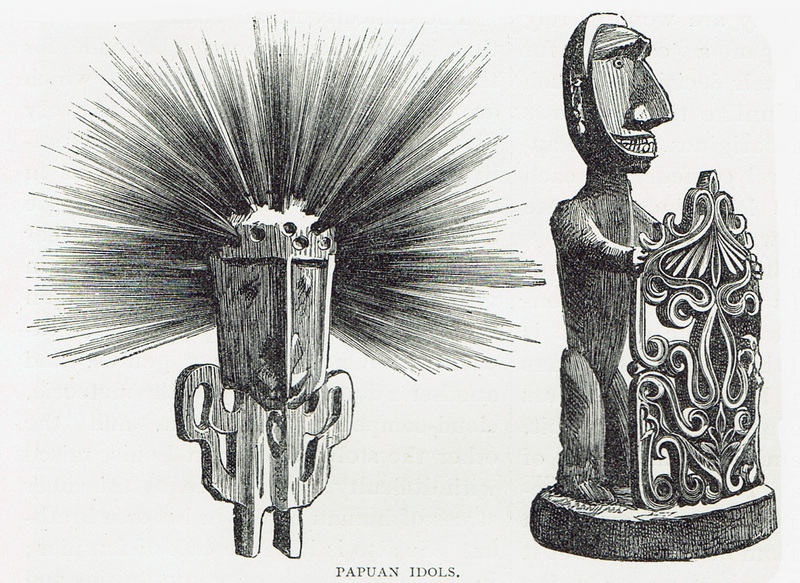 The word mana comes from Polynesian (first used in English c 1843) and is defined as "a dynamic power dwelling in and flowing from certain individuals, spirits, or things, and capable of producing great good or evil," or "power achieved by ritual means; prestige; authority," or "a concept of life force, believed to be seated in the head, and associated with high social status and ritual power." According to the Britannica Concise Encyclopedia, it is "Among Polynesian and Melanesian peoples, a supernatural force or power that may be ascribed to persons, spirits, or inanimate objects. 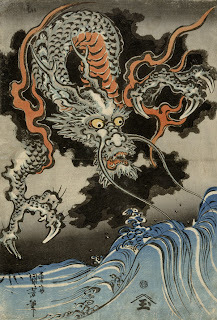 Mana may be either good or evil, beneficial or dangerous, but it is not impersonal; it is never spoken of except in connection with powerful beings or things." 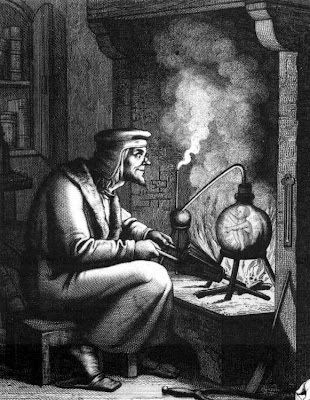 Mana is an important concept in certain religions, but I'm thinking of it not in any technical theological sense, but in its role in fantasy. The fantasy connection is obvious, since mana is one model for how magic might work in a fantasy world. In the on-line fantasy role-playing game World of Warcraft and other games of its ilk, mana is the cost of casting spells. A magic-wielding character has a certain amount of mana, and each possible spell costs a certain amount of mana. That's probably the most common usage of the word mana these days: if you have enough mana, you can work magic. If you don't have enough, you need to get more. In World of Warcraft you regain mana by waiting for your supply to slowly replenish itself. If you don't want to wait, you can drink a mana potion, or eat mana-replenishing food, or benefit from the action of various spells. And when your mana reserves are once again full, you can cast all your spells again, boom, zap, kapow. Presumably in the fantasy universe of a book, rather than the mechanics of a computer game, mana could be regained by performing rituals, offering sacrifices, eating the hearts of opponents with a lot of mana, possessing objects of sacred power, and so forth. It might be interesting to imagine that mana is captured in objects by the work of skilled artists, that truly great works of art possess mana: power. That brings me to the other thing I associate with the word mana. Mana was the subject of a talk I heard by artist Francisco Mendez-Diéz. He asserted that to be art, images must have power, and that powerful images come from deliberately looking for mana. That mana power, he said, can come from shared experiences, from authenticity and honesty to self, or from the act of adoration of an image or object. Meaning equals power. These are some interesting ideas, and while I don't think that I venerate raw power, for good or evil, to the extent that Mendez-Diéz seems to, he did say a few things I found very helpful in thinking about making and viewing art. 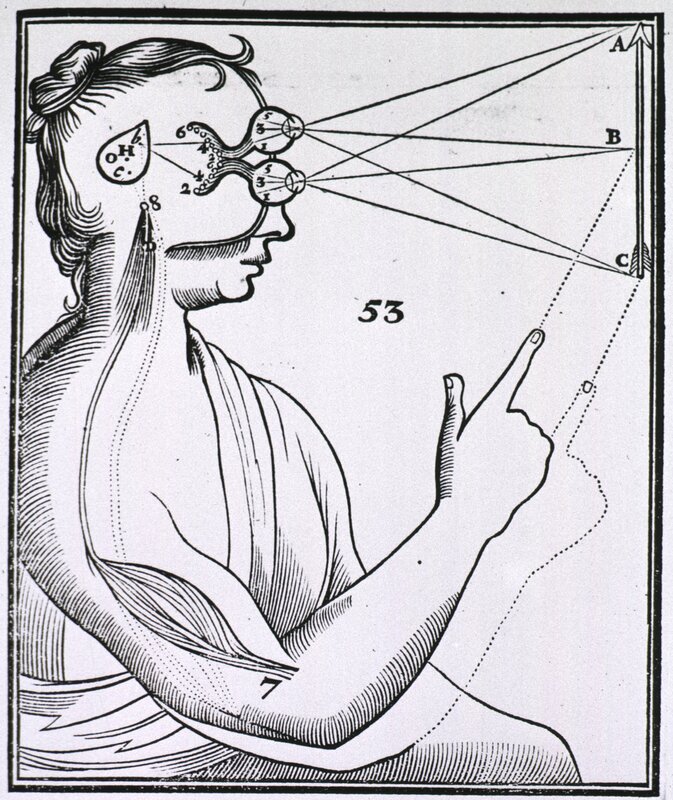 The first of these is the distinction he drew between images of power and images with power. Images of power are simply depictions of something that has no particular depth of meaning to the artist. For example, if I were to draw a picture of Zeus smiting things with thunderbolts, it would be a picture of power, but it would have no particular power of its own, since I don't much care about Zeus. Images with power, Mendez-Diéz said, are made when the artist is working with a subject that truly speaks to him, so that he's not merely depicting another's ideas and beliefs but is wrestling with his own. All this can get a little mystical for me, but I do very much like the reminder that as an artist I'll be doing my best work when I follow my own attractions, explore my own desire for understanding, and work to express my own visions authentically, rather than producing stuff that I imagine other people will want to buy. The reminder is equally valid for writing. The other interesting point Mendez-Diéz raised was a question: Is it a unique quality of artists that they see power in a different way? (I certainly don't think I see power in quite the same way he does, but whether that means one of us isn't a real artist is another question!) Think of the phrase, "Oh, I see!" meaning, "I get it! I understand." 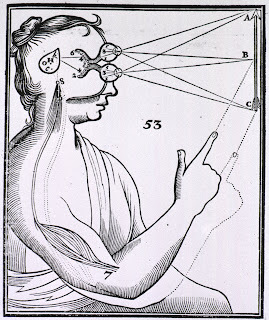 If we cultivate our ability to see, does that give us greater insight, greater understanding? And if we possess greater understanding, does that give us greater power, greater mana? I'm leery of grandiose claims about the superiority of artists, but at the same time I do believe in the power of creative habits of mind. I do believe that all of us would benefit if more of us cultivated our ability to glimpse and pursue unexpected connections, to look for alternatives, and to find and create beauty all around us. So if mana is power that we can draw on by thinking creatively, then let's hope we never suffer from the frustrated cry heard in the midst of many a desperate battle in World of Warcraft: Out Of Mana! Here's something interesting. Fernand Léger (1881-1955) is a French artist known for his own version of Cubism, Futurism, Purism, and all that was modern and populist during his lifetime. 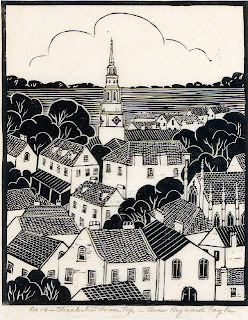 His work is usually characterized by bright blocks of color, machine-like people doing modern jobs, and lots of primary colors -- but his taste for bold geometric designs translates well to block prints. He made black and white wood blocks to illustrate a book by André Malraux in 1921. Malraux's book, Lunes en Papier, (Paper Moons) was published in an edition of only 112 and includes three Absurdist stories illustrated with seven block prints by Léger. 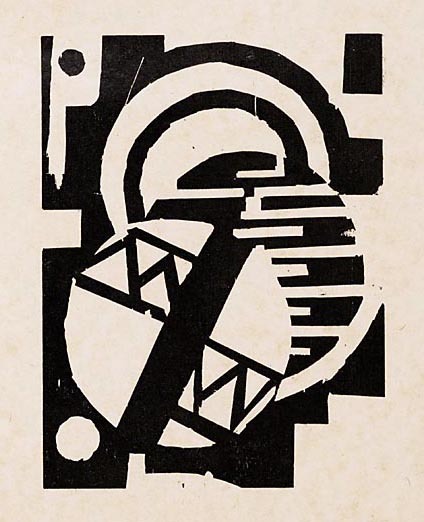 The publisher, Daniel-Henry Kahnweiler, also ran a gallery in Paris and was Léger's first champion when he first began to show his paintings and was feeling unappreciated by art critics. 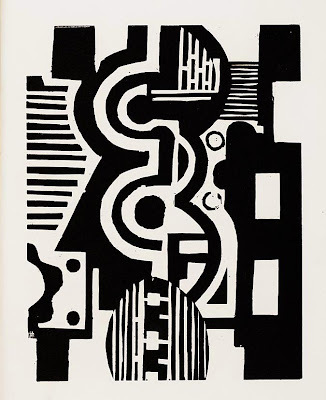 Léger's black and white images are abstract arrangements of unshaded shapes, some of which I find quite pleasing. I think my favorite is the first one above. It has a nice balance, symmetrical without being static, monumental without being dull. Thanks to the National Library of the Netherlands, where I found these images.